We celebrate the best in British designer short wedding dresses and handpick all the designs we stock. One of the designers we stock is House of Mooshki and love the elements of fairy tale short wedding dresses they make. We’ve picked out each of the elements below from some of the dresses that we stock but there are many more for you to try. Every House of Mooshki short wedding dress has a stunning neckline. They accentuate the shoulders, neck and décolletage beautifully. With illusion necklines that provide coverage but give the illusion of a strapless dress. Lace is another pretty addition to the variety. Sarah is a short tea length wedding dress. The satin bodice is overlaid with a sophisticated delicate ivory lace. A bateau neckline with scallop lace edging leading onto cap sleeves. Shown here in the apricot with an apricot satin detachable belt. With scallop lace edging leading into cap sleeves, these are details that make beautiful fairytale short wedding dresses. Or go for full sleeves with stunning Guipure lace detail that also flows onto the full skirt. Charlotte is a tea length gown with long sleeves and sheer back decorated in ivory guipure lace that creeps over the arms and down the bodice. 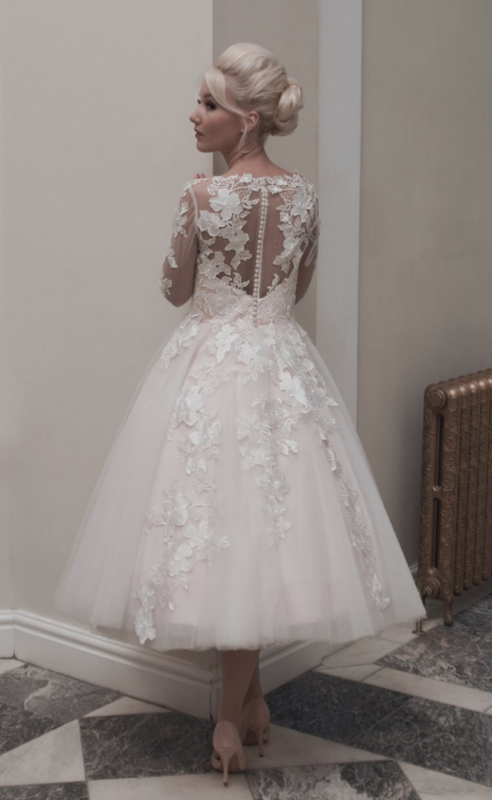 This is such a feminine fairy tale dress that is just as stunning at the back as it is the front. The details on a House of Mooshki tea length dress are gorgeous and unique. The wedding gowns can be further altered to make them truly bespoke. They offer a fabulous selection of colours from ivory, white, blush, vanilla, champagne and many more. Bows are a fun addition to the short wedding gowns and there are lots of different colour ways these can come in. Poppy by House of Mooshki is a beautiful tulle and lace vintage 1950s inspired wedding gown with cap sleeve and button back. It’s pictured here in a soft plush that adds to the fairytale feel of the dress. These wonderful retro wedding dresses all have full 1950s skirts. They are wonderful to twirl and swish in at the wedding reception. With a beautiful tulle overlay in either polka dot French corded lace to hand dyed Guipure lace appliqué. Jocelyn is a calf length vintage inspired wedding dress with a soft vanilla tulle overlay and squared bodice. Beaded lace to bodice and straps. Hand dyed guipure lace appliqued to the bodice and skirt with a scattering of pearls embroidered to the lace for a decadent look. Every House of Mooshki wedding dress is the perfect tea length short wedding dress. These create that pretty fairy tale short wedding dresses style to perfection. Add petticoats to get a fuller 1950s style skirt and match to the dress for that sophisticated style. Claire is a divine spotty and lace short calf length wedding dress with illusion spotty neckline and scallop edge trim in French corded lace. Beautiful lowered back detail and teamed with a duck egg blue bow belt. If you would like to try on fairy tale short wedding dresses then visit us today. Every appointment is one to one and you get our full attention. Try on as many dresses as you want in a non pressured environment. Cutting Edge Brides is the leading short wedding dress boutique in the UK so can help you find the perfect dress.